Is The Eclipse a Sign? Many have written and claimed to have researched a connection with this coming eclipse and Bible prophecy. I'm not claiming to reveal any prophesy regarding the eclipse, and I'm certainly not trying to "fit it in" to Biblical prophecy, but; I do believe this eclipse is spiritually symbolic. Let's discuss this, from the simple standpoint of where America stands in regard to the eclipse. The total eclipse will be viewable, only in America. A total eclipse is forecasted to take place August 21, which also aligns with the new moon that evening. So, the only time in that 24 hour period in which the moon will be visible is the few moments, through the eclipse. The eclipse is to cover this country from coast to coast. 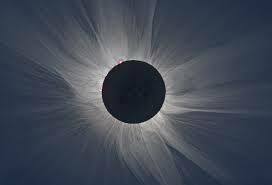 A total eclipse means the sunlight is hidden, and the new moon is not visible in the night sky. That is "darkness." There is certainly spiritual darkness covering this land, while each coast and state blame the other. The government is preparing for problems. That in itself is a problem! The areas where this eclipse is to be, best viewed are already preparing for lack and gridlock from food and water to portapotties to traffic. I'm guessing the opportunities for road rage are exponentially off the charts. Even in the midst of warnings of extreme crowding, lack of prepared infrastructure, it is reported that millions of people are planning to travel to the various sites to view this total eclipse. I use the term "reported" because there is always the hype factor to consider in media. People running to view the darkness and celebrating the event, in spite of the warnings, seems to have become a theme in America. At least the cause of this "celebration" is, in fact, natural! The idea that folks could be trapped in traffic for hours, with no access to a bathroom, to view two minutes of darkness, boggles my mind and personally, raises serious issues of claustrophobia, to say the least . . . I'm not talking out of fear, here, but simple practicality. Are the people who are planning to travel to one of these cities even considering the impact of an extra million people in any given city that does not have a population anywhere near that number? I'm not disinterested in a solar eclipse, but I'm satisfied to view the partial eclipse from right where I am. I'm interested enough to have read a few articles as well as writing this blog. I remember making the pinhole in the cardboard box to prevent eye damage while viewing a solar eclipse. A solar eclipse is fascinating, but . . . there's a big difference in being interested and the way Americans are choosing to respond to this. Our nation is so divided and extreme! A large crowd, all with the general mindset of instant gratification. What could possibly go wrong? I've also considered the weather factor. I'm not trying to rain on anyone's parade, but; what if a cloud covers the eclipse? There won't be time to get to the next site! I've fed in a few of the cities that are in the path for a total viewing to weather for you. Accuracy in weather forecasting is never guaranteed, but a chance of cloud cover, plus traffic in unfamiliar territory does offer a bit of credence to the government's attitude . . .
Not to mention how badly people behave when things don't go their way. In the case of inclement weather will we hear, "Not my eclipse!" In the case of traffic standstill, will "tolerance" prevail? Will there be safe spaces? Even before following Messiah in Covenant with YHWH, I knew this verse and repeated it to myself on many sad occasions through my young adult years. Looking back now, I'm still not sure I understand all the insight of "work together for good" in some of those instances, other than to serve as reminders to never "go there again." Some relatively recent comments have taken me back to 2012, and the number of times that year I repeated to myself, Romans 8:28. The year 2012 stands out as one of the most difficult years, if not the most difficult, in my Covenant walk. "Can We All Be Wrong?" was published in 2011 and it was exciting, but I also knew it would be a game changer. My daughter, with whom I'd always had a very rocky relationship, responded so positively after reading my book, I got my hopes up for awhile, a short while . . . as it wasn't long until I was recognizing the usual serpentine twist to my words . . . Although, it ultimately ended badly, the reality of the situation became crystal clear and the end was simply grieved and put in the past. Much revelation knowledge came through that situation and within a short time, I could truly embrace and appreciate the fact that all the human plans had fallen empty. YaH did not have to protect me from the situation of my own doings, but He did . . . and from what I hear, she is happier than she's ever been. So, although it didn't turn out as I first hoped, another old saying has played over and over in my head as I've moved forward. "Sometimes the only thing worse than not getting what you asked for, is getting exactly what you asked for." But that was just one factor in what was a difficult year. In my attempt to be self-sustaining I've been raising many of the basic needs, so thought I'd launch into a few specialty items, one of those being, red pepper sauce. I went to a local nursery and bought a four pack of what was supposed to be tabasco pepper bedding plants. As it turned out, they were red, but the shape didn't look like any tabasco pepper I've ever seen, but that didn't deter me from attempting my first jar of pepper sauce. I placed a few in the blender with water, vinegar, and a dash of salt and hit the button. When I removed the lid, my eyes immediately began to water. There was no way this sauce would be good on chicken wings. My son in law recognized the peppers and likes 3 or 4 in his chili. As it turns out, I raised a bumper crop of habanero peppers. In that same summer, we had a drought and a plague of grasshoppers. I noticed there were no grasshoppers on the habanero plants, so the batch in the blender became a pesticide, and I began soaking several in grain alcohol to make an extract, planning to maintain my organic pesticide. By then I really was feeling like Jonah, knowing the situation mentioned in the second paragraph that was taking place was not G-d's will for this place and my ministry. This community game that we were all playing was not the plan, and I knew it, but I really didn't want to know it . . . Sadly it took a couple more calamities for me to face reality. At the beginning of the summer, I broke my arm, then did so again and the end of the summer . . . The "pseudo community" had collapsed and dispersed, and I was alone finishing up chores, the second time I broke my arm. it was obviously quite damaged in a number of places, so I gritted my teeth, straightened it as best I could and called the neighbor to help me wrap it. The pain was pretty severe, so I began to contemplate some natural pain killers, besides straight alcohol, when Father led me to do a bit of research on spicy peppers. Within an hour, I had a formula of essential oils with this wonderful pepper tincture, that I applied, every few hours. The relief was amazing. I'd started a company the end of 2011, but it had basically taken a back burner to the mayhem that ensued in 2012, and as I settled in to actually get the soap business rolling, it became clear it was to go beyond just soap and skin care systems. The years of natural health study was going to be poured into this business and what was helping myself and my family, I would make available to others, via an internet store. Now, nearly four years later, the product I shakily made for myself in the fall of 2012 (that is both definitions of "fall") has become one of the products in greatest demand. If all that hadn't happened the way it did in 2012, I can't imagine how things would be. The way it all happened, though, opened doors for me to minister to and help hundreds of people who are trying their best to stay out of, or get out of the system. Although 2012 was a rough year, it really did work together for my good, and the good of many who have benefited and will benefit. Recently, I heard an interesting sermon, based upon II Kings 7. As Scripture proves, once again, there is nothing new under the sun. Syria has been a problem to the people of YHWH for centuries upon centuries. Several parallels to our current situation leapt off the page, as I read and listened. I've read this passage many times. Although Elisha was the prophet of that time, and of course his words did come to pass, it wasn't his words that caught my attention this time. The words of the man who spoke against Elisha's prophecy hit with a thud in my spirit. I'm guessing if Elisha posted the coming economic change, on social media; there'd have been plenty of folks jumping in to comment negatively on the thread. So, it began with conviction and went from there . . . Immediately, I took note of the fact the naysayer saw that which was prophesied come to pass, but he didn't get to enjoy the blessing as he was trampled to death. Just a little something to ponder . . . The death of the naysayer was gleaned the first time I read this passage, and it continues to stand as a reminder, we just might be guilty of the same thing if we're not careful. It was the lepers that stood out this time, and the fact that there were four. The number four resonated with Messiah's parable about the soil. These four men were facing "certain death," one way or another. They were very obviously sick. There was a famine. There were Syrians. Sadly, as they looked at their circumstances, they determined their best chance of survival was the Syrian camp. It's even stated, if the Syrians allowed them to live, they would, but if not, they would be killed. It seemed a quick death by the hands of the Syrians would be preferred to starvation or disease. Adonai provided divine intervention of "noise" to cause the Syrians to flee in fear. As I thought of the lepers and the fearful Syrians, I realized our country is divided very much in extreme illness and fear . . . even before adding the variable of Syrians. Our nation is facing some very real enemies, as well as some imagined, but I believe the programming is the most dangerous. Now, to breakdown the potential "answers" to our current threat, we need to realize it is our own government that is introducing some very frightening solutions . . .
First and foremost, Syria has been a problem for centuries and able bodied, healthy male Syrian refugees should be a red flag. Sadly, after San Bernadino, at least one "vetted" woman has proven to be a problem as well. She wasn't a Syrian refugee, but she was a follower of the "peaceful" religion of Islam, which I will address in the next paragraph. She's proven problematic on two hands. One, obviously the fact that she was a young woman changes the whole concept of "saving the women and children." Second, the vetting procedure performed by our government to reassure us, is flawed, seriously flawed, or the vetting procedure isn't to intended to prevent what we the people think. As for Islam, Americans have now been warned and labeled regarding negative comments about Islam. I have no idea the percentage of radical extremists vs. peaceful Muslims there are, but I do know the government isn't calling negative comments about Christianity or Judaism; hate speech. If mainstream Christianity follows their history, the majority will go with the flow, leaving just a remnant to embrace Torah and the true Feast Days of YHWH. The remnant within Christianity will truly come to realize, the church has not replaced Israel, but has been invited into the same covenant, by the grace of our Creator through the blood of His Son. A few reporters have actually blamed the Messianic Jewish victim for upsetting the guy who went on the rampage. Obviously, if the Messianic Jew and Muslim had discussed their differences, the Messianic Jew had a completely different approach to resolution than the Muslim chose. Nicholas Thalasinos was one of the victims of this massacre. To even hint that his open discussion of his beliefs provoked this attack is on the same level as blaming the victim for being raped. In America, it should be safe to be "pro-Israel" and openly free about one's religion without fear of death. This isn't Nazi Germany . . .
Of course, the shootings have once again been used by the gun control advocates. California has some of the strictest gun control laws in the country. So, the good guys had no guns, and bad guys just don't care about the laws. Let's not forget, there are also explosive jackets, suicide belts, and pipe bombs. What's next on the control list? Should we outlaw hoodies and plumbing? Removing American's first two Amendment rights is not going to keep Americans safer, but it will be two giant steps toward captivity and containment . . . and we already lead the world in that, as it is. The loudest argument to manage gun control is using the issue of mental health in this country, to better vet gun purchases. Using mental health seems to be a back door approach to the same end: the end of the Second Amendment. In light of the latest DSM5-R, mental health labeling could be the most sweeping loss of freedom this country has ever seen. Determining gun ownership based upon a subjective opinion is nothing more than "thought policing." Who wants that? Apparently, this is the latest political division that is actually bringing together both a part of the liberal base along side with "concerned" conservatives. I've heard first hand, a supporter of the NRA say, they should determine who can own guns . . . Basically, the second amendment has become a political hot button issue and will continue to be, until those upholding full Bible beliefs and the Bill of Rights are outlaws. Democracy, when I was in school, was taught and defined as: The rule of the majority. Here's what wordweb has to say. 1. The political orientation of those who favor government by the people or by their elected representatives. 2. A political system in which the supreme power lies in a body of citizens who can elect people to represent them. 3. The doctrine that the numerical majority of an organized group can make decisions binding on the whole group. The recent controversy/protest in a Missouri school raises more than just the issue of "born that way." This agenda of accommodation will crumble the very foundation of democracy. The rights of one self-focused boy claiming to be gender confused, is posed to usurp the rights of the majority. That is not how democracy works! I can't determine whether this is a case of gender confusion or simple narcissism, but it is clearly not a case of democracy in action! Could these two situations possibly be contributing to the troubles in Texas? A gentleman very respectfully and graciously gave a call to repentance at Lakewood Church back in January 2015 and was escorted out by security . . .
Notice in the interview this company plans to open a place in Houston as well. John 1:1 "In the beginning was the Word, and the Word was with Elohim, and the Word was Elohim." John 1:14 "And the Word (Torah) became flesh and pitched His tent among us, and we saw His esteem, esteem as of an only brought-forth of a father, complete in favour and Truth." Yeshua is defined in these verses as the Torah made Flesh...shouldn't we keep that definition in mind when we are reading the rest of the book of John? When someone becomes a new Christian, people usually tell them to go home and read the book of John. John is one of my favorite books in the New Testament. It is full of SO much Truth! Unfortunately, by not understanding that Yeshua is the Living Torah, defined in the very first verse of the book of John, most people will read the rest of the book with no understanding at all. We must allow the Bible to define itself...in John 1:1, 14, Yeshua is defined as the Living Word. Did you realize that NONE of the New Testament was written at the time that Yeshua and John (and Paul) walked the earth? Therefore, we know that the Word, is the Torah. Yes, that's right...Paul taught from the Torah...and recognized that Yeshua was the LIVING Torah. Please read these verses in John with the understanding of the definition that Yeshua is the Torah in the Flesh (refer back to John 1:1, 14). I will insert a few words to highlight for understanding...It's pretty eye-opening. "I (Torah) am the true vine, and My Father is the gardener. 2“Every branch in Me (Torah) that bears no fruit He takes away. (yes, there are those following Torah who do NOT bear fruit) And every branch that bears fruit He prunes, so that it bears more fruit. 3“You are already clean because of the Word (Torah) which I (the Living Torah) have spoken to you. 4“Stay in Me (Torah), and I stay in you. As the branch (that's you) is unable to bear fruit of itself, unless it stays in the vine (Torah), so neither you, unless you stay in Me (Torah). 7“If you stay in Me (Torah), and My Words (Torah) stay in you, you shall ask whatever you wish, and it shall be done for you. 8“In this My Father is esteemed, that you bear much fruit, and you (the branches in Torah) shall be My taught ones. 9“As the Father has loved Me (Torah), I have also loved you. Stay in My love. 10“If you guard My commands (Torah), you shall stay in My love, even as I have guarded My Father’s commands and stay in His love. 11“These words I have spoken to you, so that My joy might be in you, and that your joy might be complete. 18“If the world hates you, you know that it hated Me (Torah) before it hated you. 19“If you were of the world, the world would love its own. But because you are not of the world, but I chose you out of the world, for that reason the world hates you. 20“Remember the word that I said to you, ‘A servant is not greater than his master.’ If they persecuted Me (Torah), they shall persecute you too. If they have guarded My Word (Torah), they would guard yours too. 21“But all this they shall do to you because of My Name (Torah), because they do not know Him who sent Me (the Living Torah). 22“If I had not come and spoken to them, they would have no sin, but now they have no excuse for their sin. 27but you also bear witness, because you have been with Me from the beginning. We cannot bear fruit unless we are in HIM (Torah). Those not in Him (Torah) are gathered and burned in the fire (verse 6).